• The look and feel of the new 12-inch MacBook turned out to be much more “drool-worthy” than I had anticipated. It is so thin and so light, it’s hard to believe there’s room for all the required hardware inside. No wonder Apple made it so difficult to open up the case. They don’t want you to see that it’s powered by metachlorians. Compared to the MacBook Air, the new MacBook is a big step up in almost every way. In terms of appearance, I much prefer the border-to-border glass to the aluminum rim of the Air. The Air’s case design is unnecessarily wide. The 12-inch MacBook has almost the same width and depth as the 11-inch MacBook Air. The new MacBook features a Retina display, absent from the Air. And I was comfortable with the resolution of the MacBook, not finding text too small (as some have complained). Unless saving three or four hundred dollars is critical ($899/$999 vs $1299), I see no reason to prefer a MacBook Air. I especially expect the market for the 11-in Air to fall to near zero over time. The 12-inch MacBook is a much superior piece of hardware — and targets the same market. The MacBook is also a serious competitor for people otherwise considering an iPad Air as their main computer. The primary downside of the MacBook remains its lone (USB-C) port. This can lead to numerous hassles that will likely require one or more expensive adapters to resolve. Even an initial first step of transferring data from an older Mac can prove to be a challenge, especially if you want speeds faster than Wi-Fi or USB 2.0. Still, I suspect that the target audience for the new MacBook will not be put off by this constraint. Speaking of USB-C adapters, after looking at Apple’s $79 USB-C Digital AV Multiport Adapter, I started to wonder why the short stretch of cable is needed at all. It seems to just get in the way. Why not have the adapter “clip on” to the MacBook when you plug it into the USB-C port, making it almost like an extension of the laptop? Perhaps a third-party is already working on this type of adapter. • Based on the online images, I had decided that gold was the color I would get, if I ever got a MacBook. To my surprise, after seeing all the models in the Store, I much preferred Space Gray (joining my friend Dan Frakes in this assessment). • I knew that typing on the new MacBook’s keyboard would feel different than on other MacBook models. But I wasn’t prepared for how different. I did not like the feel at all. It’s something I might get used to over time, but I doubt I will ever prefer it. • I walked into the Apple Store with no prior appointment for trying on an Apple Watch. I expected this would mean I would not get to see one on my wrist that day. Wrong. I was immediately offered a 15-minute session. In fact, the counter displaying Apple Watches was the least crowded spot in the Store. I’m not sure if this is a bad omen or just an outlier. • I had decided that, if I were to buy a watch, my choice would be the 42mm Space Gray Sport Watch. It looked great online and (at $399) was at the bottom of the price scale. But when I actually got to try one on, I didn’t like the feel of the band and I found its overall appearance underwhelming. Too “sporty” and not “classy” enough for my taste. 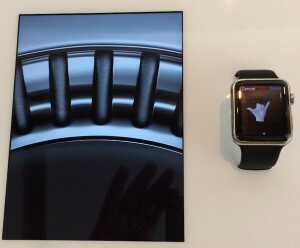 I wound up much preferring the Milanese Loop. Even at $699, that’s the one I would now get. At least I was correct in assuming that the 42mm model was the right size for me. • My biggest hesitation about getting an Apple Watch was that it wouldn’t be worth the bother. I’m content taking my iPhone out of my pocket; I don’t need a separate device to save me that effort — especially one that needs charging every night and may not always display the time on demand. However, after playing with the Watch for a while, I began to change my tune. Access to maps, notifications, email, Apple Pay, Siri, and more — all with the flick of my wrist. I could see where I would really enjoy having this device. And the interface worked much more smoothly than I anticipated. The touch screen, the button, the digital crown: I got the hang of combining their actions in no time at all. No amount of advertising can substitute for actually spending time with an Apple Watch. If you have any doubts about the Watch, you owe it to yourself to get over to an Apple Store. Like me, you may be pleasantly surprised. I’m now very close to ordering one. • One thing I totally expected easily lived up to my expectation: The gold Apple Watch Edition is an exorbitant waste of money. It’s simply a gold-colored Apple Watch. Aside from the color, it has no advantages (if you can call color an advantage). Yes, it’s made of real gold. But if I didn’t know that, I could easily be convinced that it’s merely a gold-tinted alloy. Viewing it from the glass covered display, it didn’t seem special at all. It seemed utterly absurd that the Edition watches cost at least $9000 more than the stainless steel models sitting adjacent to them. I can’t see why anyone would spend the money on an Edition. Even if you could easily afford one, you’d feel better getting 10 or more stainless steel Apple Watches for the same money — and giving away the ones you don’t intend to use. I just cannot understand why people keep writing stupid articles about AppleWatch Edition. A gold Rolex Datejust has the same movement in it as a stainless steel Rolex Datejust. It just costs $25,000 more. Why? It’s gold. And it tells everyone who sees it “how you roll”. This is normal for the watch industry. The wealthy buy these things everyday. It tells others who know what you are wearing what economic strata you are in. The only people who think it’s ridiculous are those that cannot afford it. I believe the reason that they needed a dongle for the USB-C adapter is that the output connectors are too thick and/or that such an approach risks over-stressing the USB-C socket on the Macbook. Thank you for saying what, I think, most of us are thinking: the Apple watch is great for those out here who believe they can use such an attachment. However, the Edition Gold version is off the scale. It is an over the top tip of the hat to the ostentatiously rich. All 1% of them. Apple has been from the beginning a populist enterprise. A computer company for those who love computers and computing. This is off the chart. As a device, the A watch is yet to prove a device that would enhance my life in any way. The reason for the short cable is because of stress on the socket in the computer. If you attach an adapter that is heavy (by the standards of the connector size), it puts a strain on that small connector. A short cable receives the stress. Ted, if you want gold, you’ll get gold. It’s the same with any other watch. The Rolex President in gold costs $17,000 more than in SS. Is is worth it? Yes, to those who buy it. It’s not a valuable opinion as to whether the Apple watch is worth what you would pay for it in gold. If you have a visceral negative reaction to more expensive accessories in gold, then you won’t like it. You seem to have that. Others don’t. It was hardly worth the comments you made about it. To understand why I believe the gold Apple Watch Edition is not directly comparable to gold Rolex watches, see my prior column. That said, I concede that stepping up from a stainless to a gold Rolex shares some of the same issues as with the Apple Watch. It’s just that I don’t see the Apple Watch in the same league as a Rolex. To me, the Watch Edition is more like stepping up from a stainless steel to a gold can opener. More silly than status. The Rolex costs much more in any version, so they’re not comparable in that way either. But this is not an issue of whether the Apple watch is of equal value to a Rolex. The Edition begins at $10,000, and the Rolex President gold, at $27,000. How much is a smartwatch worth? What about the people buying Vertu smartphones, which aren’t even the latest, or highest end, inside? Apple doesn’t expect to sell large numbers of the Edition. It’s there for other purposes, and it’s valid as a product.